I accidentally created this Mediterranean Chickpea Salad while trying to use up some items in the fridge. Now I’m in love. It’s the perfect work lunch as you can literally make it out the door. It would also make a great light dinner on the days you’re not up for cooking. There’s no meat involved, so this salad is Vegetarian friendly. It’s also Vegan and Gluten Free. Although it lacks meat, there’s still an abundance of protein provided by the chickpeas. Best of all, the rest of the toppings are from jars that you probably already have in your pantry or fridge. 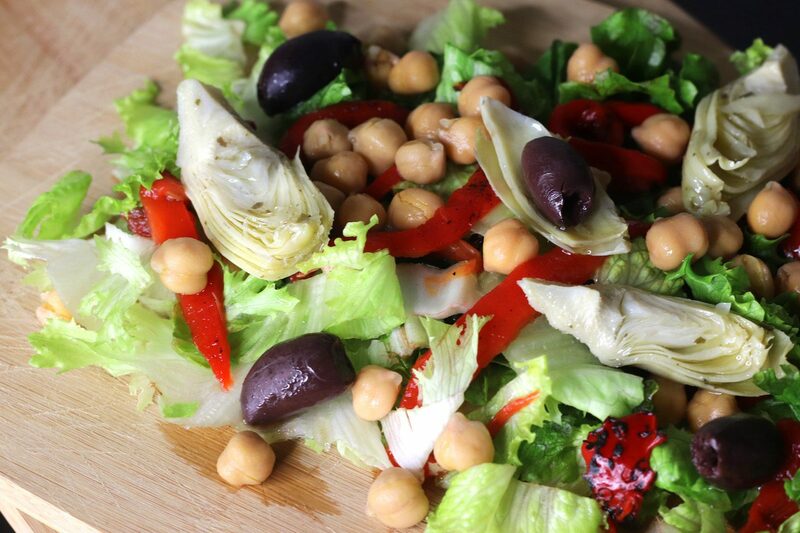 Marinated artichoke hearts, fire roasted red peppers and Kalamata olives add lots of flavor. While a homemade Lemon Balsamic Vinaigrette seals the deal. 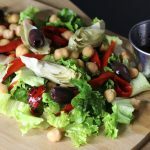 I’m sure you guys will love this Mediterranean Chickpea Salad as much as I do! 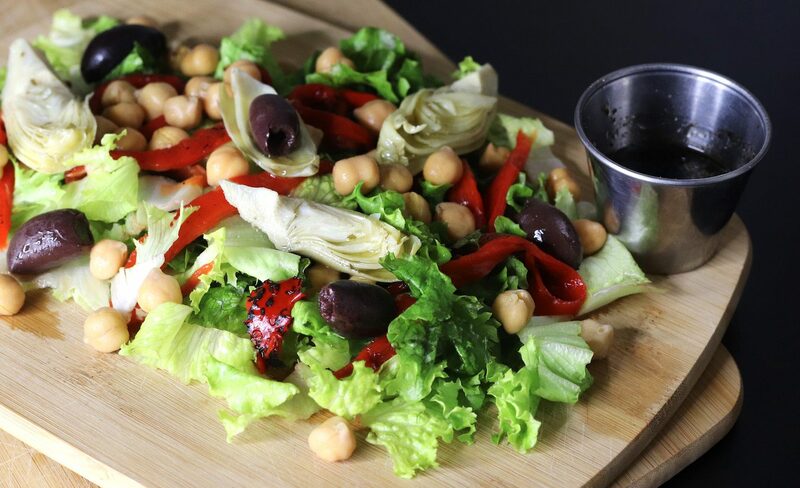 Robust & hearty, this Mediterranean Chickpea Salad is easy to assemble with toppings that you probably already have in the fridge. Wash & chop the lettuce, and dry thoroughly. Lay out on a plate or cutting board. Chop the fire roasted red pepper, and place on top of the lettuce. Next add the marinated artichoke hearts, Kalamata olives and chickpeas. 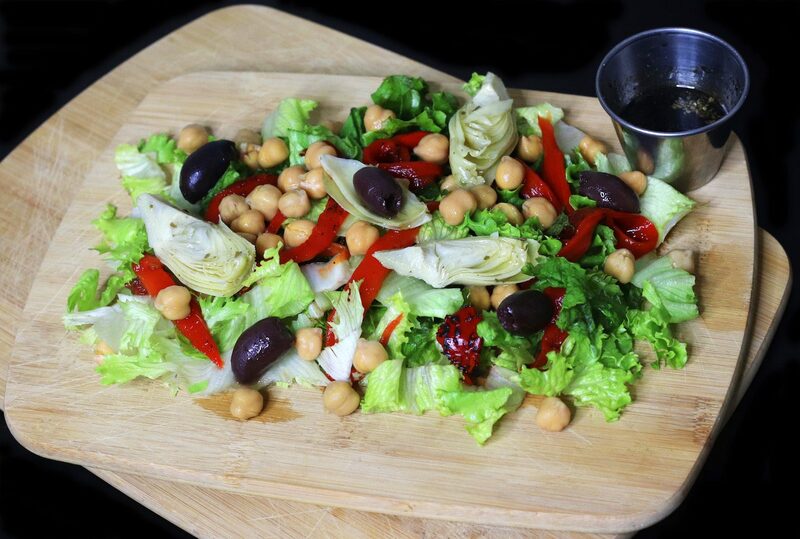 In a small dish, thoroughly mix the ingredients for the Lemon Balsamic Dressing, and serve on the side. Pour over the salad before eating. Enjoy!